“Is me—Bob. Bob Marley.” Reincarnated as homeless Fall-down man, Bob Marley sleeps in a clock tower built on the site of a lynching in Half Way Tree, Kingston. The ghosts of Marcus Garvey and King Edward VII are there too, drinking whiskey and playing solitaire. No one sees that Fall-down is Bob Marley, no one but his long-ago love, the deaf woman, Leenah, and, in the way of this otherworldly book, when Bob steps into the street each day, five years have passed. Jah ways are mysterious ways, from Kingston’s ghettoes to London, from Haile Selassie’s Ethiopian palace and back to Jamaica, Marcia Douglas’s mythical reworking of three hundred years of violence is a ticket to the deep world of Rasta history. This amazing novel—in bass riddim—carries the reader on a voyage all the way to the gates of Zion. 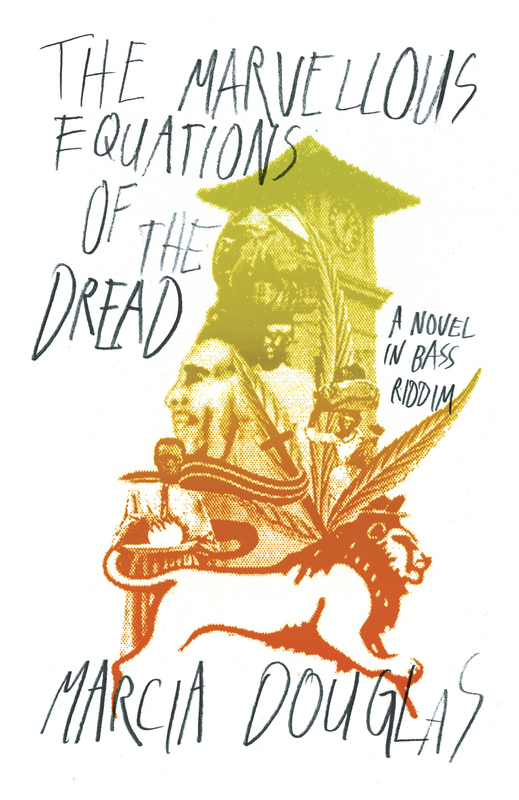 The Marvellous Equations of the Dread: A Novel in Bass Riddim… has the air of a spell. A beautiful and otherworldly book; a work of poetry steeped in history and rich with imagination. Douglas has a way of conveying the sense of wonder that powers the island’s creative spirit. Douglas writes with an almost Biblical diction…Weaving a complex and warmhearted tale — one told through multiple voices — against a backdrop of violence. She can be uproariously funny too — the patois practically jumps off the page, and things can go from light to dark in an instant. Her chapters are tracks that all work well as singles, but when played together pulsate with great power. Marcia Douglas’s book is as marvellous as its title – one of the most stunning new works of Jamaican fiction I have had the pleasure of reading. The novel that is not unlike the island that it tries to capture – as musical as it is brutal, and here is writing as full of poetic heft as it is of narrative drive; even as you want to linger and relish in the language, the novel demands that you turn the page. A powerful woman-centered version of Jamaican her-story. Marvellous Equations of the Dread harkens back to the past of slavery, oppression, and violence to account for the situation in Jamaica today…Mystical. A lyrical convocation of reggae, roots healing, the history of Half Way Tree, of duppies and fearsome body-swapping, of dangerous youthmen and deliberate revolution— here is prose steeped deep in portents, parables, and a profusion of signs. Marcia Douglas lets the sounds fall from on high, in prose that chants down Babylon and confirms the coming, sweeter than can be reckoned, of Zion. Rhapsodic, poetic, scripturally engaged and endlessly inventive. Not only is the electric atmosphere of Jamaica evoked with sensuousness, delicacy and love; so is the ‘dub-side,’ a studio yard just the other side of death, where Bob Marley and a toothless and lisping Haile Selassie discuss the relative merits of routes to Zion. Marvellous Equations of the Dread is a celebration of the conflicted Jamaican experience. The women in Marcia Douglas’s books are proud women: they are the descendants of Queen Nanny, the Maroon chieftain who, according to legend, could catch the bullets of the British soldiers between her teeth. A pulsating tale revolving around the return of Bob Marley’s spirit on a Kingston street corner dubbed Half Way Tree—it’s about the transmigration of souls, Rasta dreams, and the powerful vibrations of consciousness passed down through generations. A whirlwind of a novel that sways to an irresistible beat. The spirit of Bob Marley dominates this novel, which evokes the rich, bottom-heavy sounds of Marley’s music. You can’t tell the living and the dead here without a score card, and a score card would be too linear… Think of this book as a haunted island with spectral voices and inscrutable mysteries. A rollicking, music-rich, dream-filled, polyphonic tour through Jamaica’s past and present, both in this world and, on the “dub-side,” beyond it, The Marvellous Equations of the Dread is a masterpiece of linguistic and narrative inventiveness, a contemporary literary marvel. A magical realist journey through the history of Rastafarianism, Bob Marley & Jamaica—not necessarily in that order. Rhapsodic, poetic, scripturally engaged and endlessly inventive. Not only is the electric atmosphere of Jamaica evoked with sensuousness, delicacy and love; so is the ‘dub-side,’ a studio yard just the other side of death, where Bob Marley and a toothless and lisping Haile Selassie discuss the relative merits of routes to Zion. A vast panorama of a small corner of Kingston, a musical novel where the music is reggae, a historical documentary set in the present: As the illustrious and anonymous living and dead materialize to reenact, retell, and undo their life stories, it’s impossible to resist reading these voices out loud, adding your own to this orchestrated hubbub.